American household debt set off the global financial crisis in 2007. But for much of the subsequent recovery, America has looked like a paragon of creditworthiness, according to a commentary in The Economist. Its households have rebuilt their balance sheets; its firms have made bumper profits; and its government goes on providing the world’s favorite safe assets. If people wanted to look for dodgy debt over the past decade, they had to look elsewhere: to Europe, where the sovereign debt crisis dragged on; to China, where local governments and state-owned firms have gorged themselves on credit; and to emerging markets, where dollar-denominated debts are a perennial source of vulnerability. The commentary questions whether they should look again at America; household debt here has been shrinking relative to the economy ever since it scuppered the financial system. But since 2012, corporate debt has been doing the opposite. According to the Federal Reserve, the ratio of non-financial business debt to GDP has grown by eight percentage points in the past seven years, about the same amount as household debt has shrunk. President Donald Trump has repeatedly vowed to loosen Wall Street’s leash, but some of regulators’ most meaningful efforts to revamp post-crisis constraints on big banks are running into problems, Bloomberg News reported. Take the Volcker Rule, which restricts banks from making risky market bets with their own money. Under Trump, federal agencies sprinted to rewrite it, issuing an overhaul plan last May. Yet instead of showering regulators with praise, industry lobbyists blasted Volcker 2.0, arguing that it might be even more confining than the version already on the books. Now watchdogs are going back to the drawing board to rethink a controversial method they came up with for determining which trades are banned by Volcker. That will probably require re-proposing the whole thing, a step that experts say could push banks’ timeline for getting relief into next year. Another key proposal from Trump-appointed regulators that’s hit a stumbling block would revise what’s known as the leverage-ratio rule: a requirement that lenders maintain a minimum level of capital against their assets so they can withstand losses. A rewrite released last year could let Wall Street firms re-deploy a whopping $121 billion now locked up in their banking subsidiaries. In their rush to get something out, the Federal Reserve and Office of the Comptroller of the Currency issued their plan for changing the leverage ratio last April without the participation of another agency that must be involved: the Federal Deposit Insurance Corp. At the time, the decision made some sense. The FDIC was being run by a holdover from the Obama administration because the Senate hadn’t yet confirmed Jelena McWilliams, the banking lawyer whom Trump picked to lead the regulator. But McWilliams raised a caution flag last month, saying it could be legally questionable for her agency to just sign off on the Fed and OCC’s proposal after the fact. She said the rule may need “some kind of re-proposal.” If that happens, it would restart a months-long bureaucratic process. Elaborating on their ABI Journal article "Too Broke for a Fresh Start" about chapter 7 being too expensive for those in need, Bankruptcy Judge Henry Callaway (S.D. Ala.; Mobile) and Jonathan Petts of Upsolve (New York) talk with former ABI Resident Scholar Prof. Drew Dawson of the University of Miami School of Law about why chapter 7 is out of reach for those in need. They also discuss potential technological, policy and administrative solutions that could help make chapter 7 more accessible to low-income debtors. Click here to listen. Click here to read their article "Too Broke for a Fresh Start" from the February 2019 ABI Journal. 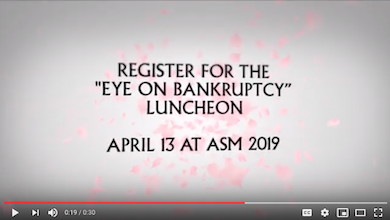 ABI’s Commission on Consumer Bankruptcy is preparing to release its final report of recommendations at ABI’s 2019 Annual Spring Meeting, set for April 11-14 in Washington, D.C. To view the ongoing work of the Consumer Commission, including videos of open meetings and prepared witness testimony, please click here. Senate Banking Committee Chairman Mike Crapo said that the committee is planning to tackle legislative reform of government-sponsored housing finance enterprises in the current congressional term, according to a recent blog post.